The lure of increased performance with relatively low purchase price has resulted in Harland Sharp rocker arms becoming a popular upgrade for many MGB enthusiasts. Although these rocker arms are advertised as a direct replacement part, some serious attention to detail is necessary if problems such as pushrod clearance and overall lack of performance are to be avoided. 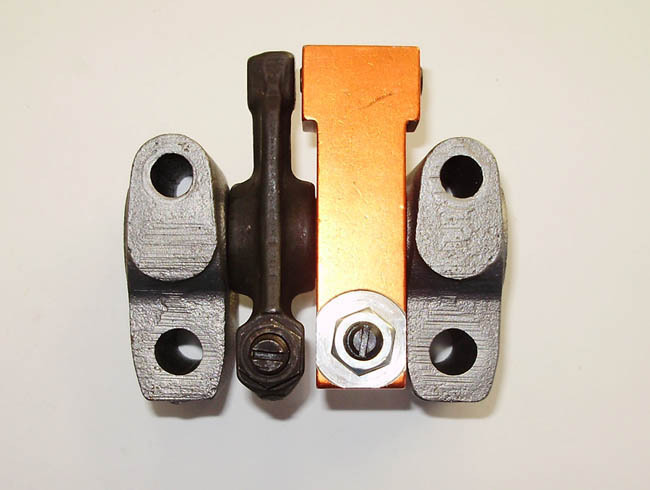 If you haven't already read The In's and Out's of Aftermarket Rocker Arms, doing so first will help you attain a better understanding of the theory behind the information presented below. All the problems encountered when converting to Harland Sharp rocker arms can be attributed to the fact the original MGB rocker assembly was designed around a wiper pad style rocker arm, rather than a roller tip style rocker arm. This difference results in the original rocker shaft height being too low for the new roller tipped rocker arm design. In essence, you are making a modification to the design of the engine by installing these rocker arms and how well you do it, determines how well the engine performs when you are through. The first most important aspect to consider is how proper rocker shaft height is affected by the addition of a roller tip rocker arm. 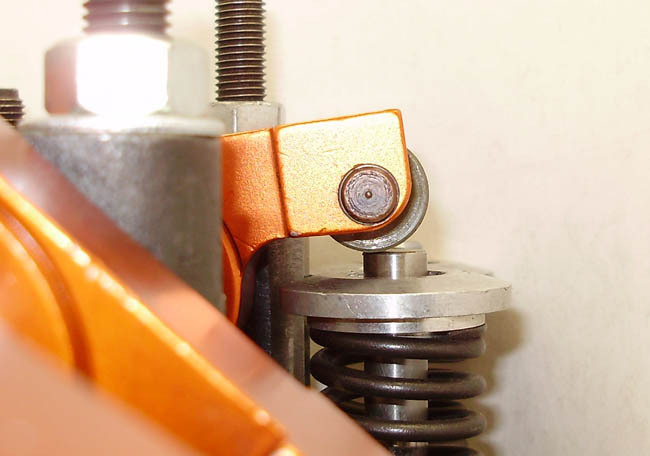 Wiper style rocker arms use the contact point of the wiper pad and valve tip as a pivot point, but roller tip rocker arms use the roller axle as their pivot point. This change in pivot location constitutes a need to raise the rocker shaft by a like amount if proper installed geometry is to be maintained. Standard Harland Sharp rocker arms have an exceptionally large .3025" radius (.605" diameter) roller tip, while the British Automotive Spec. version has a smaller .2725" radius (.545" diameter) roller tip. Either set needs an increase in rocker shaft height however, with the standard version needing the greatest increase. If adding .300" worth of shim under the rocker pedestals were all that was necessary, life would be easy indeed. Unfortunately, camshaft lift also has a direct effect on proper rocker shaft height and cannot be ignored. Just how critical is rocker shaft height for proper performance? In our testing, the installation of the 1.5:1 rocker arms with an uncorrected rocker shaft height resulted in a meager 1.44:1 peak ratio. Since the stock ratio is 1.426:1, these results show why many users of the Harland Sharp 1.5:1 sets cannot determine any performance increase once the conversion has been completed. In these cases, it's not the rocker arm itself that is to blame, but rather a simple lack of understanding on the part of the installer. Shimming the rocker pedestals for correct shaft height is the first step toward achieving full delivered ratio, but pushrod length is equally as important. With the rocker shaft at the correct height, standard length pushrods will be too short. When rocker arm adjusters are used to compensate for pushrods that are too short, big changes to the delivered rocker arm ratio results. In our testing, the 1.5:1 rocker arm set achieved less than 1.42:1 maximum ratio with the adjusters extended to meet stock length pushrods. 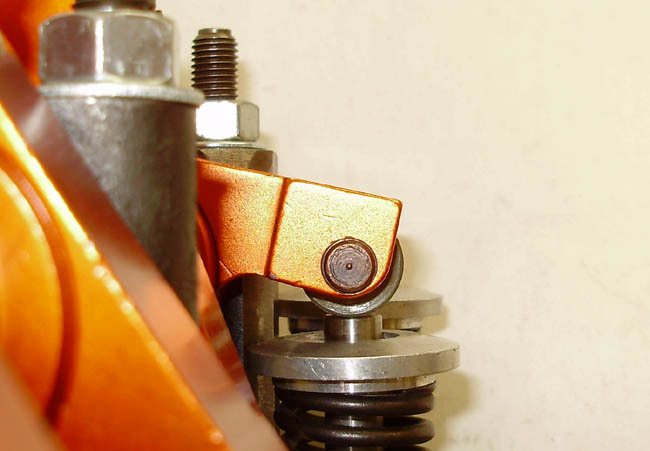 It is therefore important to set the rocker arm adjusters correctly before determining proper pushrod length. A straight line (called the pivot axis line) must be capable of being drawn through all the pivot points of the rocker arm. When this condition is met, the right length pushrod can be found using an adjustable length checking pushrod. Checking pushrods can be lengthened or shortened as necessary to achieve the correct working length. The adjustable checking pushrod is set to its shortest length on installation and then extended until proper valve lash is obtained. Once the correct length is found, a full set of pushrods can be purchased. The suppliers listed below offer kits and pushrods to any length or size needed. Roller tip radius = .3025"
One half net valve lift = (.256" / 2) = .128" × 1.5 = .192"
(1.625" + .3025") = 1.9275"
1.9275" - .192" = 1.7355"
1.7355" is the corrected rocker shaft centerline height above the pedestal base in the cylinder head. Since the original rocker shaft centerline height = 1.4225"
1.7355" - 1.4225" = .313" rocker pedestal shims required. 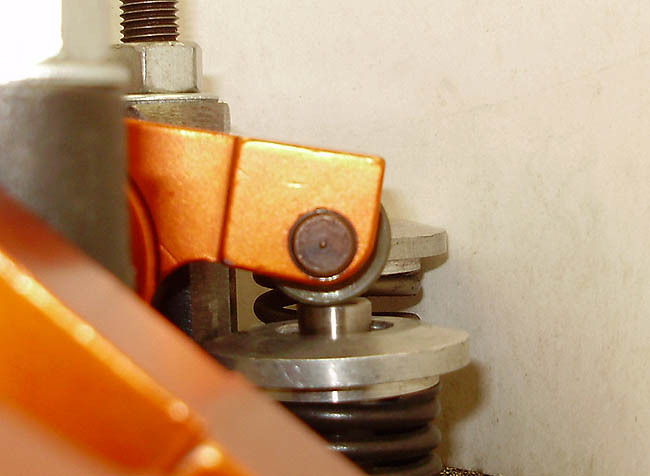 The increased ratio of the Harland Sharp rocker arm is apparent in this photo, by the location of the adjuster screw being closer to the rocker shaft itself. This is a 1.5:1 Harland Sharp rocker arm with uncorrected shaft height at the beginning of its travel. Note how the roller is inside of the valve stem center, nearly to the point of rolling off. Here is the same rocker arm as above, but at full lift. Note how the roller tip is now closer to the center of the valve. 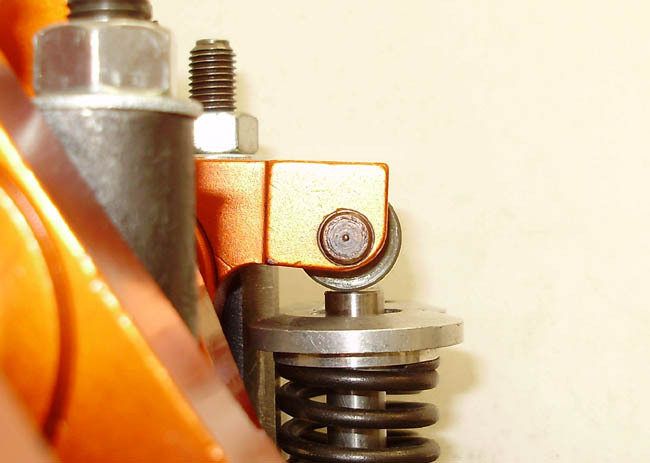 This excessive roller movement is a classic symptom of improper rocker shaft height. In this photo we have corrected the rocker shaft height as discussed in text. 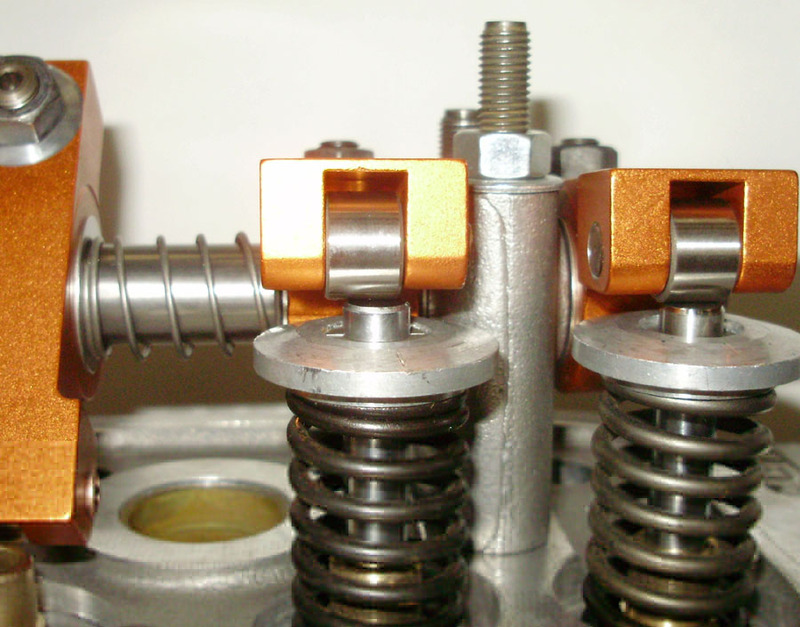 Note that the rocker arm is nearly in the same angular position as the prior photo, but the valve has not yet started to open. 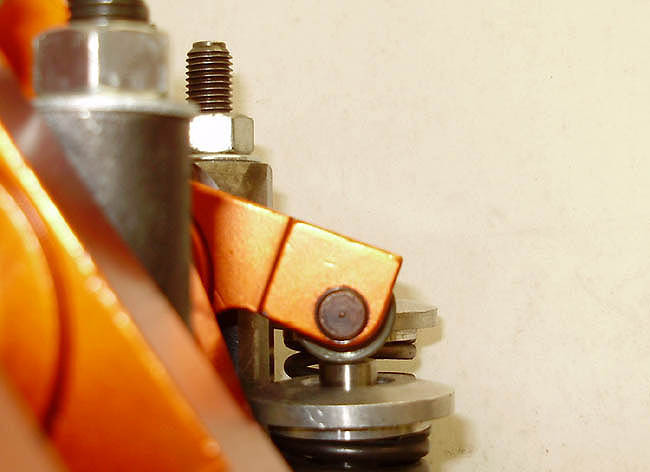 Here the rocker arm has achieved one half the total valve lift and the roller has moved to its outermost position. At the full lift point, the rocker arm roller returns to the original start position on top of the valve. 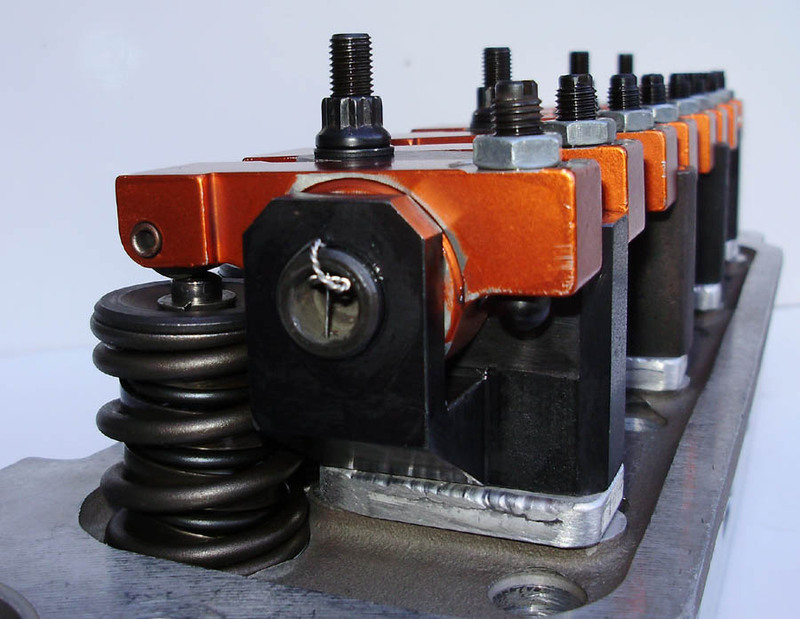 This minimal range of movement can only be achieved when the rocker shaft height is correct. For a camshaft lift around .300", your Harland Sharp rocker arms should start off at about this angle when the valves are closed. Note proper adjuster position. 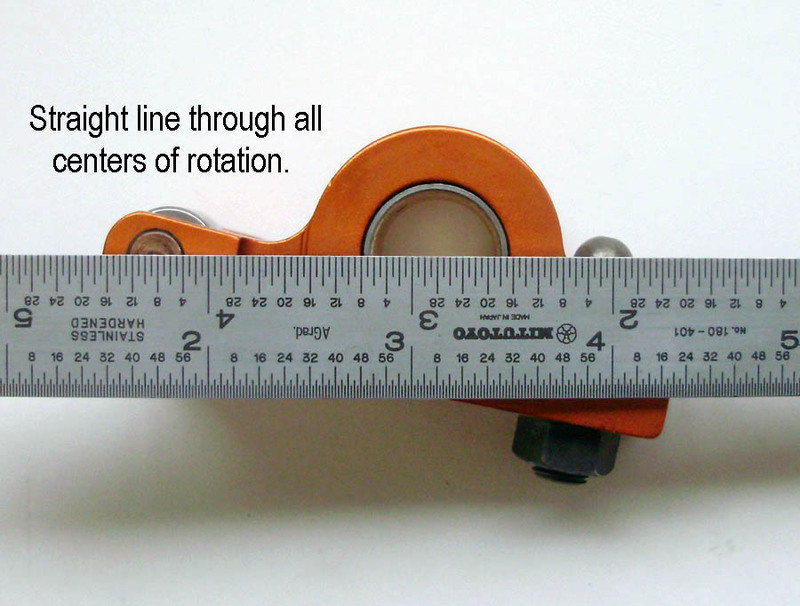 In this photo a Harland Sharp rocker arm is set to allow a straight line to be projected through all points of rotation (called the pivot axis line). This is the first step towards achieving proper pushrod length as discussed in text. 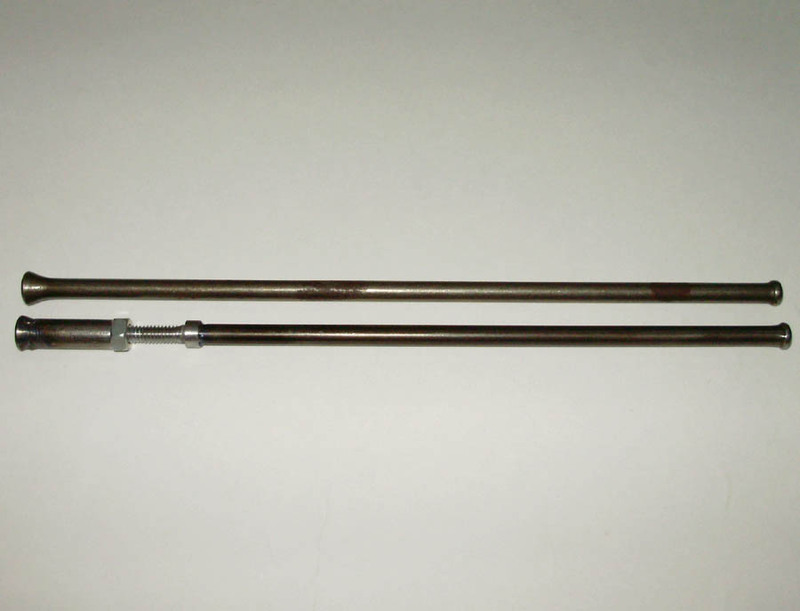 Shown is an adjustable checking pushrod against a stock one. Manufactures sell these for around $10 each. When using solid spacers instead of springs, we like to see between .005" and .010" clearance when measured as shown. 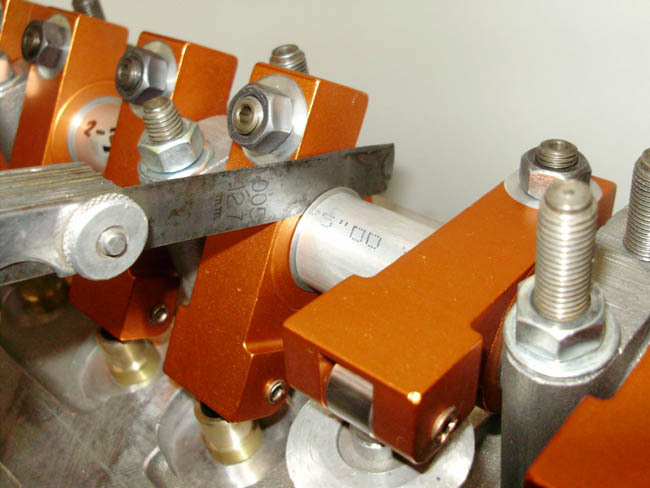 When using the .025" shims supplied with the British Automotive Spec rockers, some machining of the rocker pedestals is necessary to allow the roller tip to align with the top of the valve. This photo shows how far off it can be.